After walking east, out to the end of Pier 39 and back, I walked by a Wax Museum (with a replica of actress Elizabeth Taylor, dressed as Cleopatra I believe, out front); countless t-shirt and souvenir shops; cotton candy, hot dog, chocolate and candy sellers; camera/electronics stores; huge steaming pots of crabs; and fishing boats decorated with holiday lights and decorations. Lots going on, and lots to see. Because of my dawdling, to buy a new camera and take numerous pictures, this short jaunt turned into a three + hour walk. And the only reason why I hit the 2 mile mark, is because I followed all the piers and walkways as far out to the Bay as I could on the way back. Despite all the attractions, and clear views of Alcatraz and night lights, the wildlife count was fairly low -- due mostly to the fall of darkness. There were no sea lions to be seen or heard. They usually congregate on docks just north of Pier 39. 1 Western Grebe; 21 sea gulls; and no sea lions out this evening. Yes, another day of wonderful sights and tastes, and hardly any headway on the mileage/kilometer front. San Francisco, with its dramatic landscape, and so many points of interest, is an amazing place to walk and take pictures (and a great place to eat). 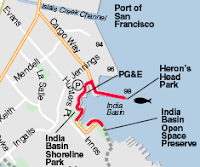 Today's walk, north along The Embarc adero, straddled daytime and darkness (given that it's December). I passed restaurants, a local chocolatemaker, dinner theater/circus (Teatro Zinzanni), tour boats to Alcatraz, pedicabs, and glimpses of the Bay itself. On a more serious note, I took some pictures this evening in honor of ex-colleague, and talented photographer, Neil Kelly, who died in a car accident on Highway 101 yesterday. Neil, you left us all too soon. 12 sea gulls, 2 pigeons, and tourists/holiday revelers buzzing around Pier 39 area. Today we managed another slow crawl through the San Francisco Ferry Building -- and odd-numbered* Piers North of this foodie paradise. (Well, we got as f ar as Pier 7.) There were too many fun and interesting new sights. We were lucky to cover a mile or so today. 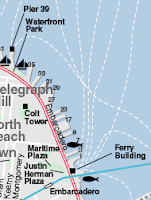 In addition to views of Coit Tower (see image) and antique rail cars going by, there are several public walking areas on the Bay that are not visible if you're driving by on Embarcadero. The Port of San Francisco building (Pier 1 area) also has on display interesting old photos and historical information for those interested in stories about the San Francisco waterfront. Thank you to Toni, who provided good company, helped uncover new places, and patiently waited while I took photos of sea gulls. 26 sea gulls; 28 pigeons; 2 Western Grebes; 6 cormorants; 4 ducks; and 3-4 parrots** in tree in park near Justin Herman Plaza. 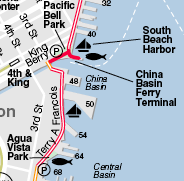 *Years ago, the piers south of the Ferry Building were given even numbers, and the piers north odd numbers. **See Judy Irving's award-winning documentary "The Wild Parrots of Telegraph Hill" for more information on this local flock. The San Francisco Ferry Building is a foodie paradise. Whatever exercise I got today, was quickly negated by all the food items I picked up there: chocolates, macarons, pumpkin ravi oli, a provolone and salami cone. I did enjoy watching other people being active: ice skaters, fire throwers/dancers, and assorted commuters. It was another cold day, where I was dressed in full-on winter attire. 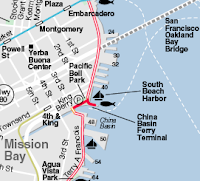 Today's walk had me covering some of same ground as previous day, walking East and then North along Embarcadero/Barbary Coast Trail, because the street parking was a few blocks away from where I ended last time. The biggest milestone today was walking under the Bay Bridge. I didn't quite make it to the Ferry Building, but I'm looking forward to a stop there next time. Note to sea gulls swarming over fast food (orange toast?) being thrown in the water: people food could be hazardous to your health. Do as we say, not as we do. While the Bay Trail doesn't really extend West into the little channel under the Lefty O'Doul (3rd Street) bridge, I decided to follow it almost to the end, near where the houseboats are moored. A pair of sea lions surfaced and swam nearby. After this little detour, I walked East, past AT&T Park (formerly known as PacBell Park), and North along the Bay. With traces of snow on the hills, I bundled up for the cold weather. I looked rather like a homeless person - who of course is trying to stay warm - and not like one of the fashionably, but lightly, dressed folks dashing between heated buildings off the Embarcadero in San Francisco. Never mind, I was very happy to be outside taking pictures of every interesting bird, building, or bizarrely photogenic item in sight. I stopped at the Java House for eggs and bacon to refuel for a few minutes. I ended my walk today at the Delancey Christmas Tree lot, south of the Bay Bridge. It was interesting to see plans taking shape on today's walk up the Terry A. Francois street segment. Thank you to Toni, who accompanied me. We strolled (North) by the new biotech campus in the building phase, south of the ballpark; passed the striped blue and yellow Cirque du Soleil tents (the cirque was in town); and spent some time walking around McCovey Cove and the China Basin Park area across the water from the stadium. We continued North, over the bridge, to AT&T Park (where the San Francisco Giants play baseball (formerly known as PacBell Park)) -- walking out as far as the end of the pier near the marina. It was a great day to see cormorants. This is the largest number I've seen to date in one area. 31 pigeons; 7 brown pelicans; 63 cormorants; 17 sea gulls; 30 Western grebes; 24 little brown jobs (LBJs); 4 ducks; 1 sea lion; and 1 ball on a bench by the water. Cove Park to take a few pictures (my first view of some Bay). I also took a short detour up to 3rd St. to Sundance Coffee, for an iced tea to go. I passed some new large commercial buildings around 17th/16th Sts., as yet unoccupied. My turn-around point was 16t h St. (just North of Agua Vista Park/fishing pier). On my walk back down Illinois, I passed some old, grand, but decrepit-looking abandoned buildings, and the Potrero Power plant. Today's walk was all along surface streets (double yellow lines on map). 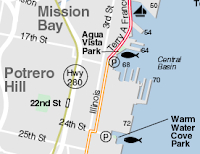 The actual amount of Bay that can be seen from Heron's Head Park => C argo Way => 3rd St./Illinois was fairly minimal. I first walked past the Recycling Central facilities, and walked NW on Cargo Way. I stopped for a train. I walked by several commercial buildings. In short, it was what I expected for a port in a busy city. After bearing right onto 3rd St./Illinois, I had a view of the water (Islais Creek Channel) as I walked over the bridge. Several brown pelicans were floating and diving in the water or standing on the shore. When I reached the intersection of Illinois and 25th St. I turned around and went back. A mix of acorn-bearing, olive-looking, and coniferous trees were planted along Cargo Way (thank you to Friends of the Urban Forest), which made the area less stark. Later, I saw a cactus against the wall of one commercial building. Being close to the Bay will probably help moderate the temperature and protect it from freezing temperatures this evening. I may check later to see if it made it unscathed. Last, there was a certain amount of ivy along the sidewalk. I'm not fond of ivy (when it becomes invasive), but I took a few close-up shots of ivy leaves that were green and red -- December holiday colors. (example shown below). Port activity can be seen to the North. (Innes Ave. =>Aurelius Walker, shown as an elbow-shaped double yellow line on Bay Trail map above). Aurelius Walker (Fitch St. on older maps) ends in a cul-de-sac, where parking is, I believe, possible/legal as well. We got lucky. Today (Saturday) was a non-49er-football game day at Candlestick Pa rk; and we parked in the Park area, across from Candlestick Park Stadium. It was sunny, but quite windy at the end of the point past the last fishing pier. You could, when gusts were strong, easily lean into the wind, without falling over. 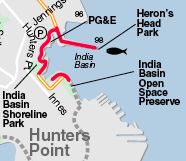 After walking out to the Point, we walked (West) down Harney Way toward Bayshore (yellow parallel lines), retracing some of my steps along the Bay from earlier in the week. We then walked East, and North as far along South Basin as possible. A few 49ers fans (for game next day) were starting some early tailgate picnic activities; and ground squirrels were in abundance, dashing across the trail at unpredictable intervals. 16 ground squirrels; 88 sea gulls; 16 ducks; 1 black oyster catcher with orange beak; 6 crows; 26 little brown jobs (LBJs); 7 unidentified brownish shorebirds; 3 rusty screws; and 1 rabbit. The weather stayed sunny for our second walk today, but cooled off quickly as the sun went down. Alec & I re-parked (near India Basin Shoreline Park playground area) and walked the upper segment of this (red line) trail, past the old P G&E facility, and out to the end of Heron's Head Point (Park), and back. The Point offers some nice views across the Bay, and of large ship/port activity (to the North). It was quiet due to the holiday (U.S. Thanksgiving), and there were only a few other people, out walking their dogs. By the end of the afternoon, we had worked up an appetite, and went home to enjoy Thanksgiving dinner, and bake a few pies (pecan and pumpkin). 14 Canada geese on playground grass; 1 hummingbird; 1 black and white cat; 34 little brown jobs (LBJs); 7 coots; 85 ducks; 60 sea gulls; 3 American avocets; 4 unidentified brownish shorebirds; 2 pigeons; 3 snowy egrets; 3 cormorants; 1 great blue heron; 3 Western grebes; and 2 black oystercatchers, with orange beaks, that cried & flew away. We walked this short segment of trail (red line on map) until we reached the fence topped with barbed wire (i.e. up to the fenced off old Naval base that is being redeveloped) at one end, and what looked to be an abandoned boat marina at the other end. I was only able to cover a short bit of trail late this afternoon, but I enjoyed seeing the different colored areas of cement and tile work that decorated the trail along Harney Way down toward Highway 101. Although some of the tile work at the trail end needed repairs, I could still see a nautilus shell shape when looking at this area on Google maps (aerial or satellite view). 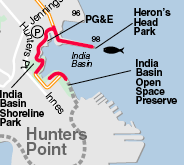 The protected area of Bay below Candlestick Point seemed to be a popular hang out for sea gulls and ducks.